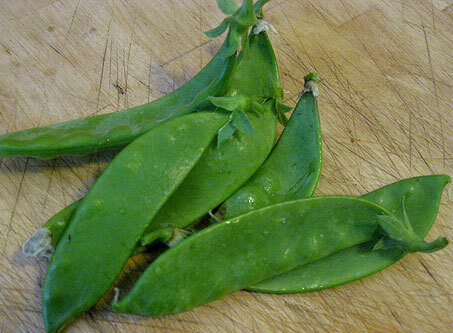 A few years ago the USDA published a standard for sno peas, or any type of edible pea pod. The standard is titled U.S. Grade Standards for Pea Pods. When inspecting sno peas there are usually a few defects you would be on the look out for. You would immediately notice the freshness, looking for the color of the calyx as a good indication. A fresh green calyx is preferred over a dry turning brown to brown calyx. If the calyx is turning brown, is it a defect? Nope, there is no requirement the calyxes be a certain color. Hard to imagine one inspecting sno peas and measuring for all the different scoring guidelines…..and these sizes are all based on a sno pea 2-1/2 inches in length. Find a defect on a longer sno pea and these guidelines become skewed, as you are allowed more of a defect on a larger specimen. One scoring defect I found inconsistent was the defect “yellowing.” No one will want to purchase sno peas that are yellowing (of course no one will pick up a moldy sno pea either, whether it had 5% or 25% of its surface covered in mold). But surprisingly the U.S. No. 1 Grade Standard allows for a sno pea to have up to 10% of its surface with yellowing. But if another sno pea was discolored, only 3/8 inch is allowed. Isn’t a yellow sno pea also a discolored sno pea? Maybe someone from the USDA Inspection Service will chime in and explain the difference. what about maturity & tenderness? how do you check for that? taste? I always examine the seam to look for signs of being overmature, or not being tender. A whitish or bleached seam is a good indicator of this. Also the seeds should be small as well. Of course tasting the snow pea is positively a good way to check for tenderness.